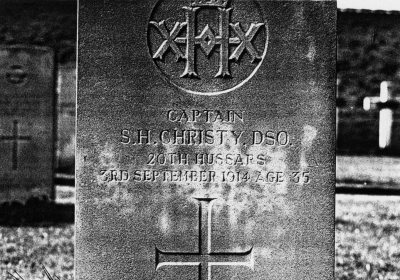 CAPTAIN STEPHEN HENRY CHRISTY DSO joined the 20th Hussars in 1899. He served in the South African War in 1902 on the Staff, and in Northern Nigeria in 1903, where he was awarded his DSO and was also mentioned in dispatches. He was wounded in that campaign. He resigned his Commission in 1906. In 1913 he was living at Plaish Hall and was Master of the South Shropshire Hounds. His wife Violet died in November 1913 and is buried in Cardington Parish Burial Ground. Deeply affected by his wife's death, Capt Christy resigned the Mastership and rejoined his old Regiment, 20th Hussars in August 1914. On either 27 August or 3 September 1914, aged 35, he was killed in action at La Fertesous-Jouarre. He is buried in the Perreuse Chateau French National Cemetery at Signy-Signets. 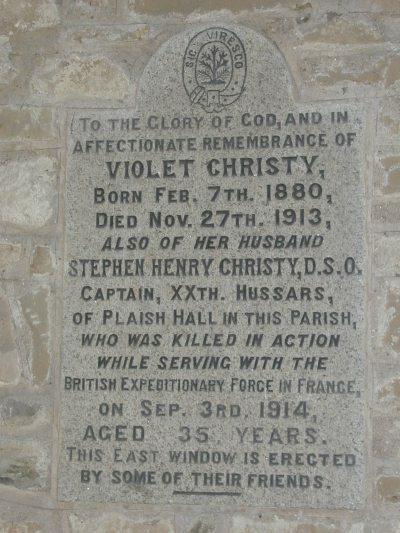 Violet Christy is buried in Cardington Parish Burial Ground near the church. 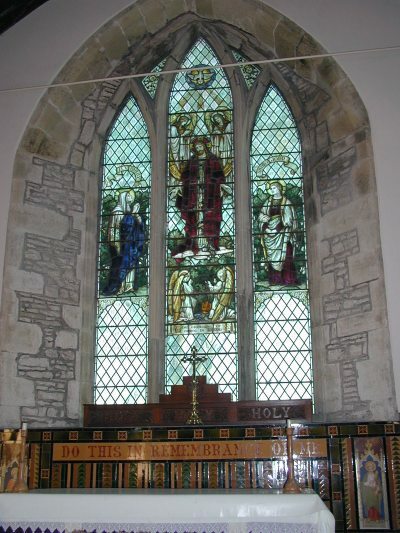 and the East Window was re-designed in their memory "by some of their friends". It would be unseemly to allow the passing of Henry Christy of Plaish to be recorded without some public recognition of his high character and devoted services to the poor and needy. In his own county of Salop, where he is to-day mourned by rich and poor alike, there is no need of such witness. There can be few who are not the richer for his friendship and ever-ready sympathy and help. Not in this neighbourhood alone, however, were his activities confined. The full extent of his benefactions elsewhere are known only to God. It was characteristic of him that they should have been accomplished, whenever possible, in secret, and by personal service. He was not the man to do good by proxy. ln his gifted young wife, who died suddenly last year, Henry Christy found a devoted helper in all good works. Through her efforts a resident nurse was established in their remote parish of Cardington, and together they planned a village reading-room and institute which is now approaching completion. Captain Christy never recovered from his loss; yet he did not permit his great sorrow to make him self-centred. Rather did it spur him on to do even more for the alleviation of the sorrows of others. At the outbreak of hostilities Captain Christy at once volunteered for active service, and was fortunately able to rejoin his old regiment as second in command of B. Squadron. He took part in all the fighting during the earlier phase of the war which terminated in the Battle of the Marne, but did not live to see the recovery and advance of the Allied Armies, having been killed in action at Ussy near La Ferte (about 30 miles from Paris) on September 3rd. The following account of his death is compiled from various letters received from eye-witnesses and others. 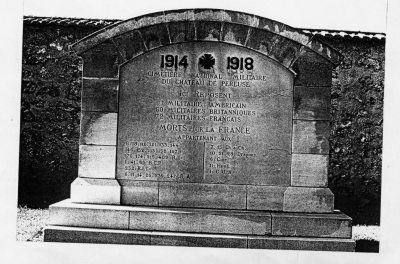 On September 3rd, when about five miles from Meaux, the officer in command of B. squadron, 20th Hussars, was ordered to cover the retirement of another squadron of the same regiment which was reported to have been heavily attacked. B. squadron held the enemy in check until the others had retired and was then ordered to fall back. They were subjected to a heavy shell fire and in consequence retired at a gallop in extended order, Captain Christy being on the left of the line. On reaching a farm, probably that of Caissy mentioned later, the Squadron was rallied, remaining there some hours, during which time Captain Christy chatted a good deal with the farmer and his people. At about 5 p.m. a hostile aeroplane was sighted, and shortly afterwards the enemy shelled the place to cover the advance of some Uhlans. 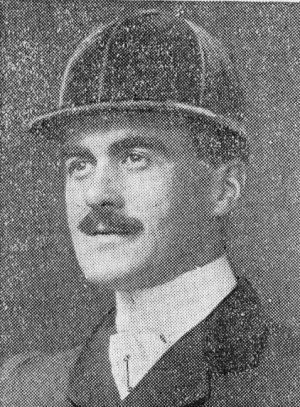 B. squadron was ordered to retire across the River Marne at La Ferte-sous-Jouarre, and while this was being done Captain Christy and his mare Kitty were both shot. There is every reason to suppose that death was instantaneous. It was some little while before the squadron commander learnt that this had occurred, and it was then impossible to go back. After the squadron had crossed the river the bridge at La Ferte was destroyed in order to hinder the advance of the enemy. On October 20th two friends of Captain Christy reached the village of Ussy near La Ferte, where they were informed that an English cavalry officer of that name was buried on the farm of Caissy in the neighbourhood. They went at once to Caissy and there found the grave in the middle of a large field. It was covered with flowers placed there by some of the villagers. The mare was buried a few yards away. Captain Christy's ring, identification tablet, and saddle were handed over to his friends, the rest of his things having been stolen by the Germans. Several of the villagers expressed to these gentlemen the gratitude thev felt to Captain Christy for the protection he had afforded them, and desired that their sympathy should be conveyed to his relatives. The following extracts are taken from letters received from brother officers. His Colonel writes: "I am confident that had he been spared he would have done some very good work in this terrible war, as he was such a first-rate officer." Another writes: "No one regrets the whole thing more than I do. Apart from being a great friend. he was absolutely invaluable in the squadron, and loved by officers and men." A third says, " He made himself exceedingly popular with the officers and men of his squadron, and his disappearance has cast quite a gloom over the regiment. Everyone says they never saw a man so utterly devoid of fear and so absolutely unselfish in every way. He used to move about the squadron chatting with the men when bullets and shells were screaming in every direction, and would even give his last cigarette to someone else rather than smoke it himself. . . . It is not every day one meets a man of his sort." It is good to remember that Captain Christy's last visit to Cardingfon was for the purpose of making his Communion; he walked down from Plaish in the pouring rain at 7.30 a.m. to do so. We need hardly say that from our village altar the prayer will often rise before the Eternal Throne that God will have him in His holy keeping. May he rest in peace. Also see Wellington & Shrewsbury Journal 27 October 1914, page 7.